A street cafe along the narrow road near the Cours Saleya market in the Old Town of Nice in Provence, France makes a great place to relax and take a break from sightseeing. People are scattered everywhere outside this street cafe located near the Cours Saleya market in the Old Town of Nice in Provence, France. One lady waits outside, others stroll by towards the market and many stop to relax and enjoy one of the delicious items listed on the sign.People who stop here for a break always seem to return due to the friendly atmosphere, the outside terrace and the quality of food served here. 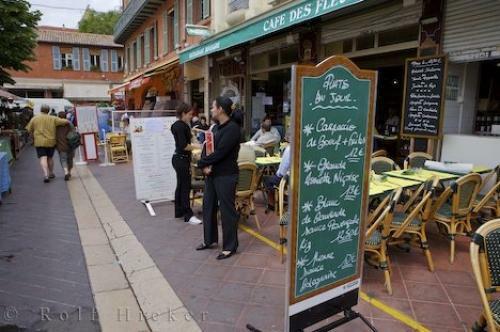 This street cafe is situated in a prime location, near the Cours Saleya market, which is listed as one of the main attractions in the Old Town of Nice.Street cafe near the Markets, Cours Saleya in the Old Town of Nice, Provence, Cote d'Azur, France, Europe. Photo of people enjoying themselves at an outside street cafe in the Old Town of Nice in Provence, France.